How about using rapidshare instead of all these unbelievably lame sites? hey – this is GREAT. Anymore SKY3d samples or feeds? I thought that the best part of the video was when it showed the fans (and the Sky logo :) ). I really hope that the 3D in World Cup will be better. You mus t setup side by side left first,and check the box “interlaced video”(deinterlacing required). 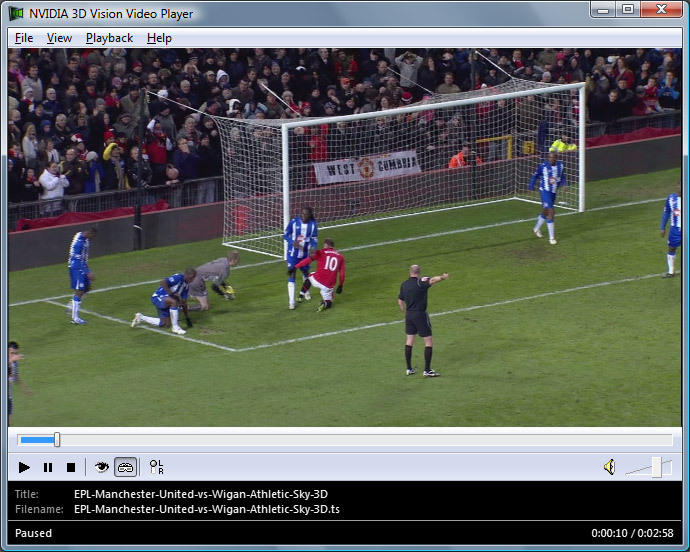 I try to play this ts file on my 3d vision player, but received the error, could not render all streams. Maybe a codec necessary to play this file is not installed. Hey. Thanks for the help. I try this method, but don’t work. Then install TS-Doctor with the Haali media Splitter and work.